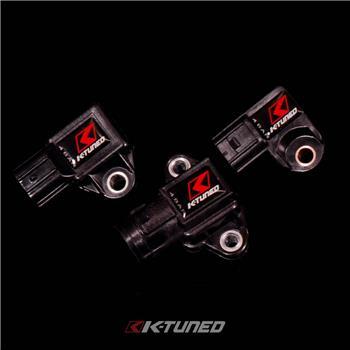 K-Tuned 4 BAR MAP Sensors are designed to accurately read the increased manifold pressures on turbo or supercharger setups and will reliably support up to 43 psi of boost pressure. The sensors feature direct plug and play fitment for several Honda / Acura applications and are easy to install. The sensor provides the fastest response time available of 0.001 seconds and an accuracy over 99%. We offer a 1 year warranty with all MAP Sensors. BAR is a unit of measure, 1 BAR = 14.5psi. When calibrating in your ECU 4 Bar will be a standard that can be easily selected or calibrated. You will simply select the appropriate sensor from the MAP tab of your preferred tuning software and your all set. Select your application carefully as there a 3 different style sensors currently available.